InLoox PM Web App facilitates to edit your project planning in a time-saving way. Find out more about the features on the InLoox PM Web App Ribbon that allow you to create and edit the planning. Create and edit an activity To create a new activity, click on the Edit tab in the New group New activity. To edit an already existed activity, select an activity from the planning list. On the Edit tab, in the Edit group click Edit. For more information on how to create an activity, see Create and edit an activity. Create and edit a milestone To create a new milestone click New Milestone on the New tab, in the Edit group. To edit an already existed one, select a milestone from the planning list and click Edit in the Edit group. For more information on how to create a milestone, see Create and edit a milestone. Remove a planning element Select the planning element from the planning list you want to remove. On the Edit tab, in the Edit group, click Delete. Use the multiselection for simultaneous deleting of the planning elements. Click the first planning element you want to delete and hold the Ctrl key on the keyboard while clicking on all the planning elements you want to delete. Then click Delete on the Edit tab, in the Edit group. You can undo an action, e.g. if you have accidently deleted one planning element. On the Edit tab, in the Edit group, click Undo. You can repeat the last action. On the Edit tab, in the Edit group, click Redo. Mark planning elements as done Select an activity or milestone from the planning list, which is finished, and click Done in the Highlight group on the Edit tab to mark the planning element as done. Highlight a planning element in the planning list Select one planning element from the planning list and click Flag in the Highlight group on the Edit tab. Choose one color from the drop-down list. Now you can see the selected flag in the planning list next to the element. Unlike in previous versions, the selected flag color does not have an impact on the color of the element in the Gantt chart in InLoox PM Web App. Highlight a planning element in the Gantt chart Select one planning element from the planning list and click Color in the Highlight group on the Edit tab. Select one color in the drop-down list. The planning element will be displayed in the Gantt chart in the selected color. Remove the defined constraints of planning elements Select from the planning list an element with time constraints and click Remove Constraint in the Action group, on the Edit tab. For more information about constraints, see Create dependencies between planning elements. Remove the dependency between planning elements Click Remove Dependency in the Action group on the Edit tab. The defined dependency will be deleted and you can move the elements as you like. Change planning direction On the Edit tab, in the Settings group, click Scheduling Settings. Select a planning direction in the Planning scheduling dialog box, e.g. Forward Scheduling or Backward Scheduling. Then add the Planning Start or End. For more information about the planning direction, see Create planning elements dependency. Stop sending notifications On the Edit tab, in the Settings group click No Notification. Notifications with project information or regarding project changes will not be sent to the project resources. Create your planning by using templates Use a previously saved planning as template. On the Templates tab, in the Action group, click Import Templates or choose a saved one in the InLoox PM Templates group from the gallery view. You can also save the existing planning by clicking Save Template in the Template group, on the Templates tab. For more information on templates, see the category Planning templates. Create a report On the Reports tab you find the features to create a report. In the Create Reports group, click Create Report. In the New Report dialog box, on the Report tab, choose a template from the Use this template drop-down list. Filter the data that you want to display in the Planning tab and then click Create. In the Reports group, select a saved report from the gallery view, e.g. Planning overview. 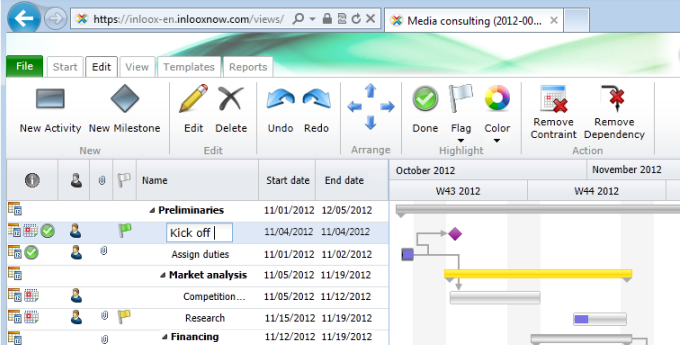 For more information on how to add a new budget template to InLoox PM, see Manage report templates. You can change the layout of an existing planning. There are several features available on the planning page that you can choose from to customize the view. Up / Down By clicking on these vertical arrows, you can move the selected item up and down in the list. You find these buttons in the Arrange group on the Edit tab. Group / Create a group by using these buttons. In the Arrange group, click . The selected planning element will be grouped one level below. On the Edit tab, in the Arrange group, click to move the selected planning element one group level up. For more information about grouping, see Create and edit a summary activity. Expand or collapse all On the View tab, in the View group, click Collapse All to minimize a group in the planning. Click Expand All to display it in the detail. Use this feature to get a better overview of your planning. Choose fields This feature sorts and organizes the project planning by selected data. On the Choose Fields dialog box, click one field, e.g. Customer, and drag it into the column headers. Reset the field per Drag and Drop back into the dialog box. Show critical path On the View tab, in the Details group, click Show Critical Path. For more information, see Show critical path. Today Click Today in the Go to group to switch to the today's view. The plan is positioned so that the red day line is on the left side of the Gantt chart. Display All Click Display All in the Zoom group to adjust the date interval of the Gantt chart to the project end or start - first and last element. Zoom / On the View tab, in the Zoom group click Zoom In or Zoom Out to change the Gantt chart view. The following time intervals are available: years, quarters, months, weeks, days, hours, quarter-hours, and minutes. Sort You can define the view of the project list by sorting it by criteria such as Name, Start date, End date or Progress, etc.. On the View tab, in the Arrange group, click Sort By. Select a criteria from the drop-down list, e.g. Critical elements. Filter On the View tab, in the Arrange group, click Filter By. Select the filter criteria from the drop-down list. Only those planning elements will be displayed in the planning list, which contain the selected criteria. Create and Edit the Project Plan in InLoox PM 7 Web App • Copyright 1999-2019 © InLoox GmbH. Tutti i diritti riservati.